This house was built for George A. Paterson in l893 by Brandon's William Bell and Sons. l039 Louise Avenue is a splendid example of the Eastlake style of architecture, which is characterized by an abundance of ornamentation produced by the chisel, gouge and lathe. Elaborately turned posts, curved brackets and spindle work are found in the handsome verandah and tower balcony. The gables are adorned with bargeboard and decorated with a semicircle of knobs and designs cut into wood. Renovations in l904 doubled the size of the house. A magnificent stained glass window "Listening," designed by Winnipeg artist John Allward, was added to the second floor landing; circa l904. 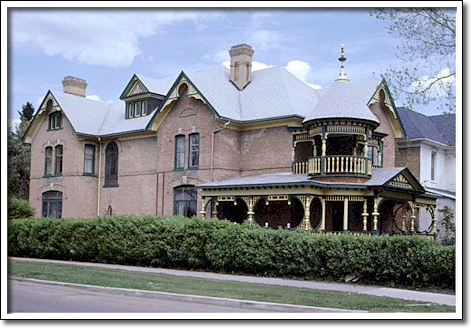 Norman A. Matheson, the owner, donated the house to the Western Region Alcoholism Foundation of Manitoba in l969.